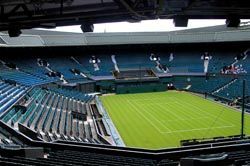 WIMBLEDON, ENGLAND--The second phase of The All England Lawn Tennis Club's three-year plan to transform the Center Court at Wimbledon includes the installation of a major new public address system. After going roofless in 2007, Center Court has assumed a more traditional look following the installation of the permanent non-moveable new roof. At the same time the seating capacity will increase by 1200 to 15,000, and the East and North stands have been equipped with upgraded leisure facilities. The dilemma facing Jon Berry from RG Jones Sound Engineering, the All England Club's long-term pro audio contractors, was in finding a system that could be installed on a temporary basis for this year's Championships, knowing that immediately after the event it would have to be removed in preparation for the third phase. A soffit will be added to the underside of the grandstand along with new roof trusses so a retractable roof can be added in time for the 2009 Championships (along with more comfortable seating). This will be complete with a moving, sliding section, carried on ten trusses. "We approached a number of different manufacturers," reveals RG Jones' sales and installation dept manager. "The constraint we were working under was the requirement that all speakers had to be located in the fixed part of the roof and provide even coverage throughout, without feedback from the Umpire's mic and presentation mics." But there is so much air conditioning ductwork carried in the roof that this proved difficult. The company thus requisitioned 71 of the AM10's, which have been specifically designed for use in stadiums and arenas where high SPL and weather resistance are critical. A further prerequisite was that the system not only had to be to weather-proofed but custom colored to blend in with the roof soffit -- thus the company has modified its standard AM10 finish to either BS12B25 spruce green or RAL 7009 green grey. They have applied a special up-rated weatherproof varnish and issued a warranty. The PA in the bowl will relay the paging calls as well as a mix of sources. These include the umpire's microphone, courtside radio microphones and wet weather microphones, and other virtually routed sources. "We can route any input we receive from the BBC or other providers, using our Soundweb system, into the court mix," explains Jon Berry. "Although we no longer have a 'Cyclops' line beep due to the Hawk-eye line call system, we now have audio sources that are required to accompany the VT and flash interviews shown on the new active video scoreboards."